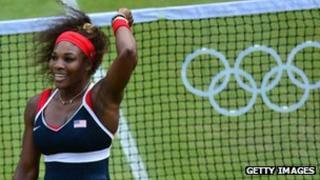 BBC Sport online registered a record 55 million visits from devices around the world during the Olympic Games. Some 37 million were from within the UK, the BBC said. The figure includes both mobile and computer access. The peak traffic moment was on 1 August, when cyclist Bradley Wiggins won his gold medal in the men's time trial. But 3 August - the start of the women's heptathlon featuring Jessica Ennis - was the busiest day as a whole. There were also 106 million requests for online video during the games . This was up from 32 million during the Beijing Olympics. Nearly two million people downloaded the BBC's Olympics smartphone app on both Apple's iOS and Google's Android platforms. "Our aspiration was that just as the Coronation did for TV in 1953, the Olympics would do for digital in 2012," said Phil Fearnley, General Manager, News and Knowledge, BBC Future Media. "We promised audiences would never miss a moment of the Games. We delivered on our promise and will build on this to leave a lasting digital legacy for audiences in years to come." The most streamed online videos were the tennis singles final matches in which Serena Williams and Andy Murray won gold medals. They were requested 820,000 times by various internet devices. Other popular video clips viewed online included German diver Stephan Feck's 'zero point' dive, Cuban pole vaulter Lazaro Borges' pole snapping mid-vault and Usain Bolt's performance in the men's 100m final.